Step 1 Heat the olive oil in a small skillet over medium-high heat. Add the grated carrot, celery and shallot, season with salt and pepper, and saute for about 4 minutes, stirring often to prevent browning, until they are very tender. Step 2 Add the ricotta and mash it with a wooden spoon or sturdy spatula to mix it with the vegetables and oil. Cook for about 30 seconds just to integrate. Step 3Add the vegetable stock. Bring to a boil, reduce the heat and simmer for 3 to 5 minutes. Allow to cool slightly before pouring into the jar of a blender. Puree until smooth. Step 4To serve, pour the soup into 8 warmed espresso cups. Place the burrata in a stainless steel dish and heat in a 350 oven for about 1 minute (or about the time it takes to pour the soup into the cups), just to take the chill off. Remove the burrata from the oven, place about 1 teaspoon on each portion of soup, and serve. In Recipes-list.com we have selected the most viewed recipes from category - Appetizers Soups Vegetarian . Enjoy the best recipes specially selected for you! 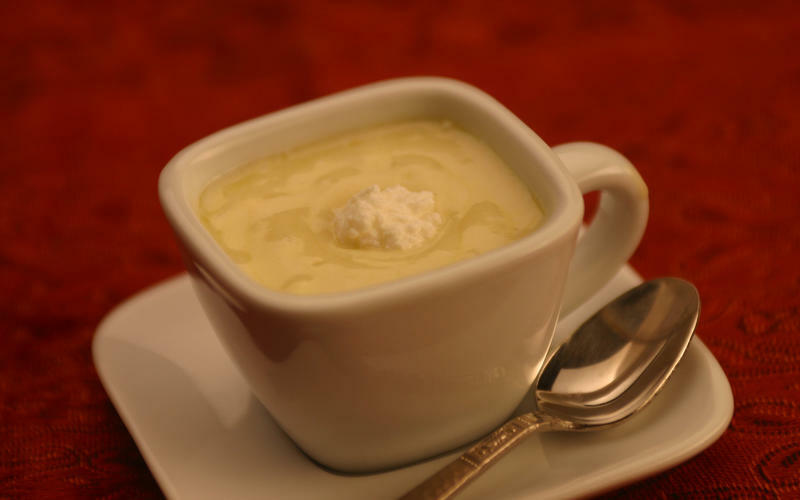 Warm ricotta soup is the right choice that will satisfy all your claims.